As far as finding a deck of cards to play with, no need to worry! On the back side of the cribbage board is yet another compartment I've made to store your deck of cards. To hold your deck of cards in place, is still another piece of brass that slides smoothly in a grooved track. So, whether you want to play at home or visit a friend's house for a game - all you need to do is grab the black velvet bag. Ooops, about the bag. The cribbage board arrives in a black velvet drawstring bag. The attractive bag protects the board when it's not in use and makes it easy for traveling. You'll always know that the pegs and the cards are all self contained inside the cribbage board and the board is protected inside the bag. The base woods that I use are Hard Maple, Red Oak, White Oak, Walnut, Bubinga, Jatoba, Padauk and Purple Heart. The inlays are from Bocote, Cocobolo, Holly and Wenge All of them are finished with a clear finish to bring out the beauty of the natural wood grain. The Exotic boards all have incredible wood inlays with burls and fabulous wood grains and are guaranteed that no two will be alike. The photos here do not show as much of the detail as seeing the real thing. You will just have to take my word until yours arrives. If not satisfied, just return it for a full refund with no hassle. What a great wood gift for that someone special. If you're a cribbage fan, you won't find any other cribbage boards with this unique style and craftsmanship. It will last a lifetime and then some. 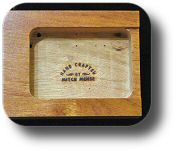 Our Cribbage Boards are custom handcrafted by Minnesota Mitch in many different and exotic hardwoods. There is a whole lot of love that goes into them as you will see. The workmanship is outstanding on every cribbage board. You will be the envy of your opponents when using them. Anyone ready for Cocktails and Cribbage? 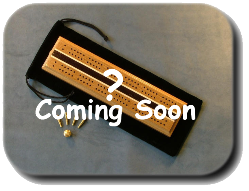 Our Exotic cribbage boards are made with exotic woods that you dont find very often. Also some uniquely designed specials cribbage boards. These cribbage boards are far from standard in the wood that is used and the handcrafted quality to build them. This is a new cribbage board that is a little thinner and a lot easier on the pocket book. You will love it.